As many of you know, because I talked about it incessantly, a few weeks ago I was lucky enough to get to fly across the country, to my old stompin’ grounds, to spend a few weeks with my friends and to celebrate the wedding of my sister from another mister, Sarah. Of course before we could send her down the aisle we had to giver her one last fling before the ring. The maid of honor, DJ, and I planned the shindig for months. Blowing up each other’s Facebook Chat with ideas, pictures and updates. The weeks leading up to the day were super stressful. Would our handmade decorations look good? Would the food taste good? Would everyone have fun? Would we be able to pull of the night Sarah had been dreaming of? Happy to report that it was a smashing success! 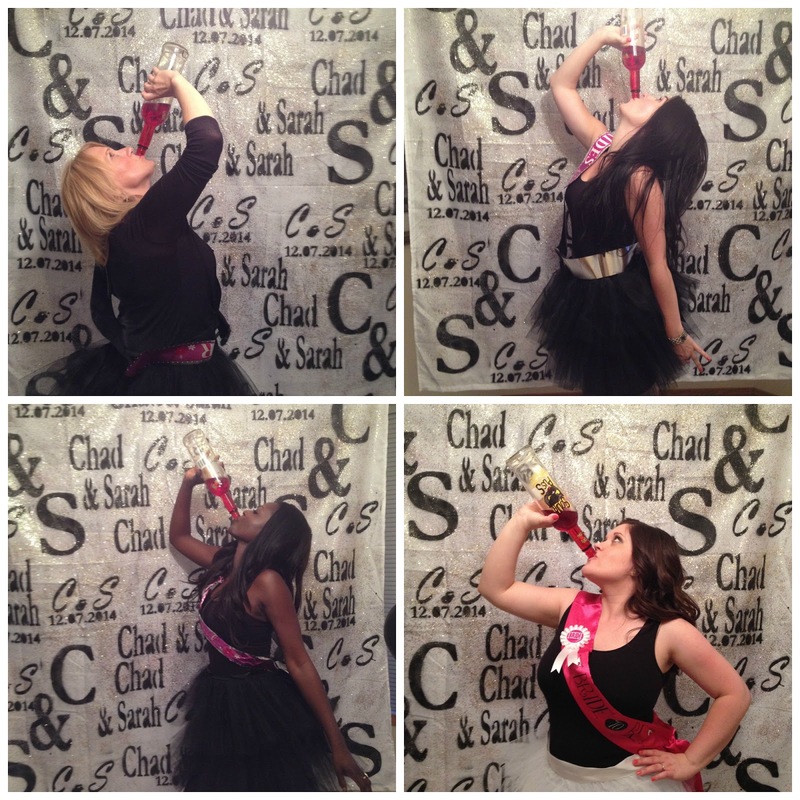 Sarah didn’t want a typical bachelorette party with straws, and pins and cakes shaped like penises (I don’t blame her), she wanted something “classy”. Obviously that meant that I would need to consult the almighty Pinterest to find ideas for decor and fun things to do. It wasn’t hard to become inspired and it was clear that this party was going to be needing a lot of glitter. 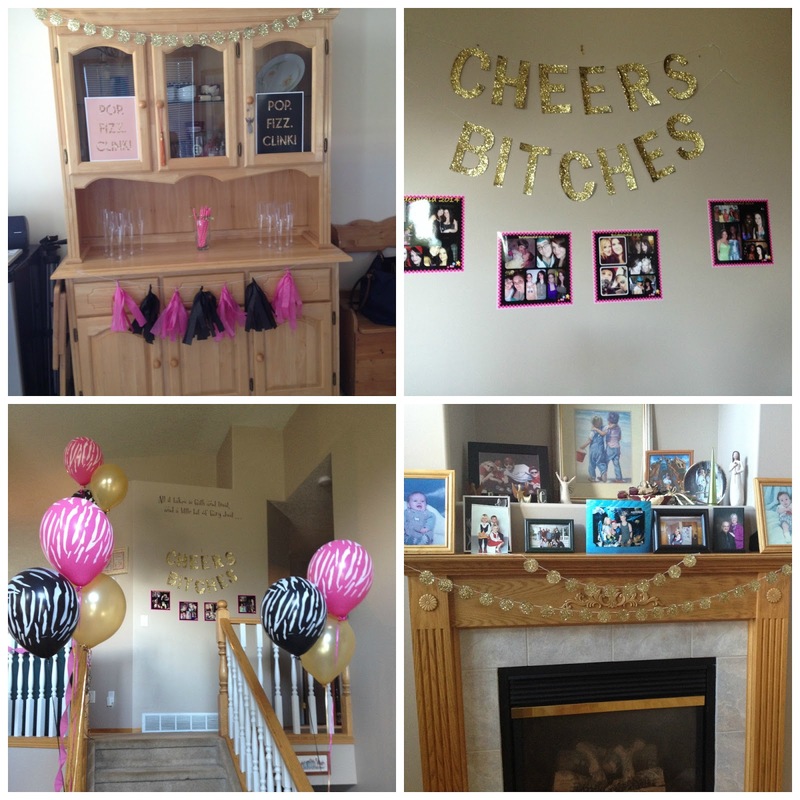 Planning a party for a large age group and one where mothers are invited is a challenge. DJ and I wanted to make sure we were “appropriate” but that everyone had a good time. And we had a lot of fun, we played the Groom Quiz and Who Knows the Bachelorette. We had a Passion Party, a photobooth, great food and tons of booze. And really y’all, thats a recipe for a great night. It certainly didn’t hurt that Sarah’s friend and my fellow bridesmaid, Fringina, was able to get up the VIP section at Spurs either. Photo backdrop inspired by this LaurenConrad.com tutorial. All you need for a good time is to chug a little Sourpuss, amirite? !